We have a number of payment options, but to be honest we prefer payment by direct debit. This allows us to operate without cash flow problems and means our customers receive the best rates we can offer. If a customer chooses to pay annually in advance, payment online or by BACS or cheque is the easiest option. Direct debit payments will be collected on an agreed date, prior to the 20th of the month. Payment amounts will be variable for all metered accounts. Payments for unmeasured accounts will be fixed every month and will not change without the prior agreement of the customer. Please contact us for a direct debit mandate. If you would like to pay by BACS, please check your invoice for our bank account details. We’ll need your 10 digit account number as a reference. Paying online is quick and easy. You can pay using PayPal or by Debit or Credit card. 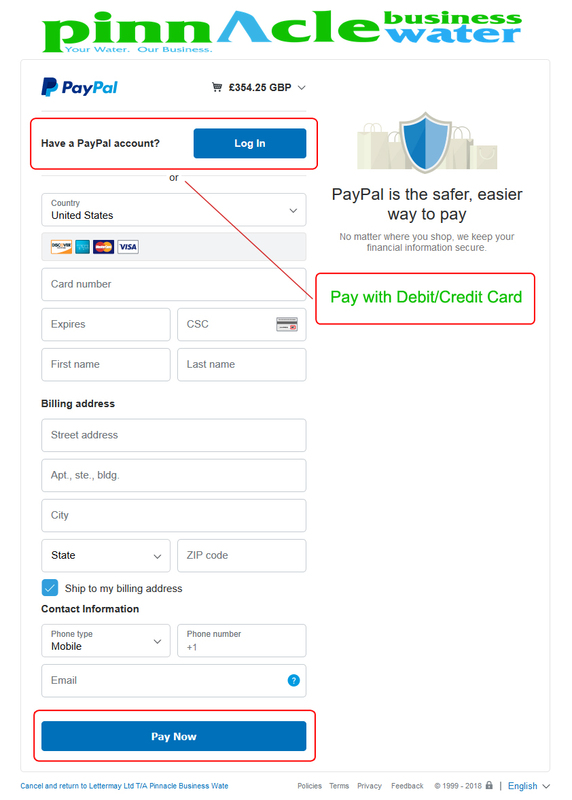 You don’t need to have your own PayPal account to pay online – have a look at our It’s Easy to Pay Online tab below for full instructions. Please note: you do not need to have a PayPal Account to pay online, see next table for more information. 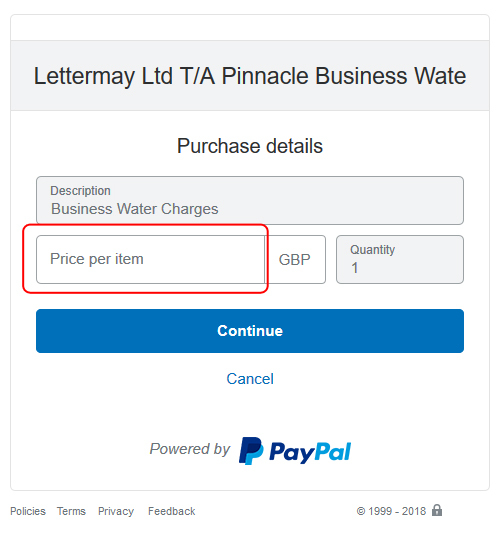 Enter the payment amount due from your invoice into the box shown, then click Continue. You can pay using your own PayPal account or by Debit/Credit card. Choose your preferred option by clicking Log In or Pay with Debit or Credit Card. Complete the required fields then click Pay Now.